The complete set of default parameters for well pressure predictions, visualisation, and exporting are controlled from this tab: Eaton and Miller parameters, velocity model, and LAS exports. Miller's method does not require NCTL. It is purely dependent on the observed sonic velocity (smoothed OSCTL) and overburden pressure (OBP). The no unloading equation of Miller's Equation is implemented. 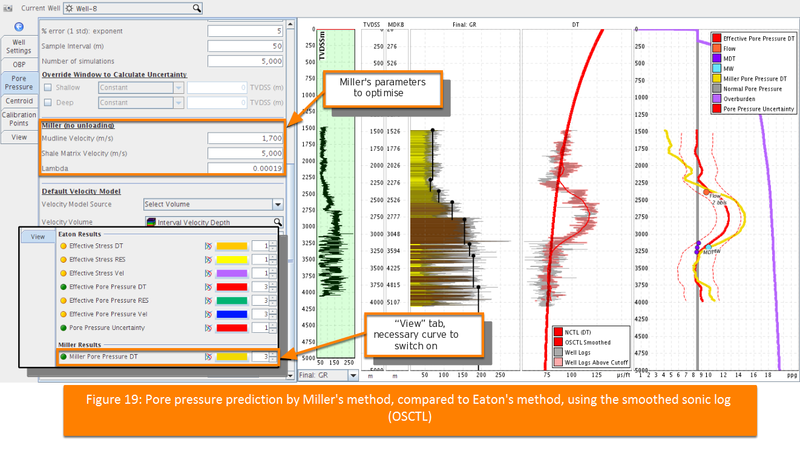 Figure 19 shows Miller's pore pressure prediction at a well location, from the smoothed sonic log (OSCTL, observed shale compaction trend line). Parameters are optimised to fit the previously estimated Eaton's method (Figure 16). Both the Eaton uncertainty bounds (see Pore Pressure Uncertainty Simulations) and calibration points (to be outlined in Calibration Points) have been added, to support the parameter choices. Note: As per Eaton's method from log (DT), the Miller's method PPP is also dependent on the shale cutoff and OSCTL smoothing parameters. Calibration Points shows how to load calibration points to verify the predicted pressures. More than the hydrostatic gradient (defined by the weight of a water column) in the shale portions. Less than the mud weight (if well is drilled overbalanced. Less than the fracture gradient (which is calibrated to Leak Off Tests, unless the formation is already fractured). Pressures predicted by the two methods (Eaton's via sonic velocity, log resistivity, and seismic velocity; and Miller's from sonic log) would be expected to agree within the measurement and parameter uncertainties (which can be simulated for Eaton's method).